Cropredy is a village near Banbury in England, UK. It's also an annual, three-day music festival, Fairport Convention's convention, with the reputation of being England's friendliest festival. It lived up to its reputation. The stage arena is perfect, with a gently-sloping hill giving everyone a view of the stage and the large screens, and easy access to all the food and nice-things vendors around the field. 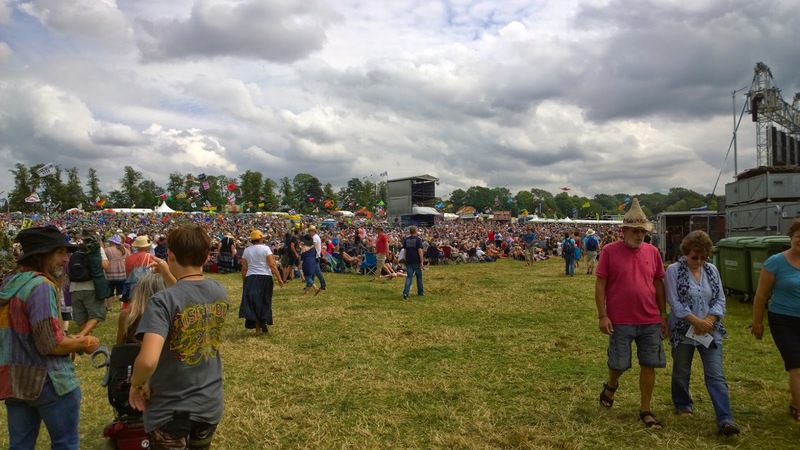 The camp sites are huge, many fields, all within walking distance of the arena and of Cropredy village, local pubs, and organizations such as school and church who prepare breakfasts for the festival-goers. Lots of people who go to the festival year-after-year. I can understand why! The festival site is kept immaculate. The loos are frequently cleaned and emptied and restocked with loo paper and hand sanitizer. There's no garbage laying around; everyone is careful to put rubbish into the bins, and vendors are concious about what they are selling (for example, no plastic cups on coffee). I found gluten-free polenta cake for breakfast one day, and coffee on sale from 6.30 am. Yes, it rained: torrential downpour on Friday, really soggy, but everyone put on plastic ponchos and the bands kept playing. Saturday morning, the sun was out (it was hot! ), a breeze was blowing, and everything dried out quickly. I even have sunburn on my scalp to prove that it was sunny. What did I learn? That at folk festivals, you take your own comfy chair or blanket, and you don't crowd surf. You might pitch a flag to blow in the breeze and let everyone know where you are. You put a plastic poncho in your pocket, ready for instant use. You may very well wear a funny hat. You might take your dog along. You definitely will take your kids along, because there are lots of organized, fun activities for them. And, of course, the music. Mostly folk and folk rock at Cropredy, but also Steve Hackett, Australian Pink Floyd, and Marillion. I really enjoyed it all!!! !